I broke out my mini springform pan again, this time for a savory recipe! 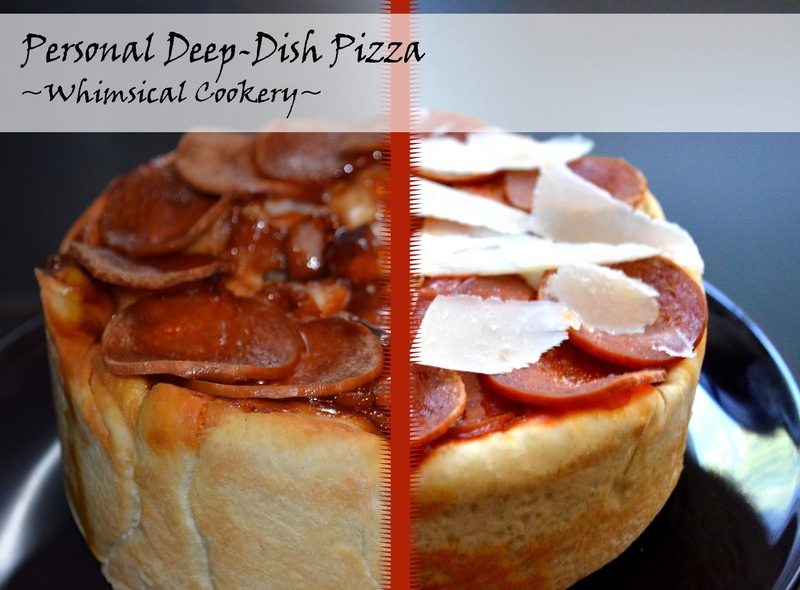 Personal Deep-Dish Pizzas! As it is a pizza, you can put any fillings you want in it. What follows are some filling suggestions and then a general recipe. 2. Heat water to 130 F, immediately add water (once heated) and olive oil. Stir until thick. 4. Return dough to bowl and cover with kitchen towel, let sit for 5 minutes. Now is a good time to very lightly grease your springform (or deepdish) pan. 5. Cut dough in half, and roll out. Keep in mind it will rise to nearly twice its height. 6. Lay dough over pan and press in, as though you were placing a pie crust. Press into sides if necessary. 7. Use fork to poke holes in dough, then cover with a kitchen towel and let rest for 15 minutes. Preheat oven to 400 F/200C. 10. Bake on a flat baking tray at 400 F/200C for 10 minutes. Be sure to have toppings ready. 11. Remove pizza crusts from oven, and fill your pizza(s). 12. Replace in oven, generally 10 minutes, or until cheese has melted or slightly browned. You can check the middle is heated by quickly stabbing through the fillings with a small knife. When you pull the knife out, check the temperature of the metal. If cooking with raw meat, a food thermometer may be necessary.